Another excellent book by Philip Marsden. He takes us on a personal tour of Cornwall to discover how its "ritual landscapes" have the power to move us with their magnetism. Philip Marsden is still in Cornwall but he has turned his gaze inland. Having set his previous book “The Levelling Sea” in Falmouth, he now takes us, and indeed himself, up the Fal River to uncover the mysteries of Cornwall with its strangely potent ritual landscapes, some dating back as far as the Neolithic period. Marsden asks a simple question: “Why do we have such strong reactions to certain places?”. The answer is less simple. We join him on his trip of discovery as he buys a dilapidated cottage in Cornwall on the Fal river and slowly unveils the power that the landscape has on the human soul – his in particular – as he grapples with his very own spirit of place and the renovation works. 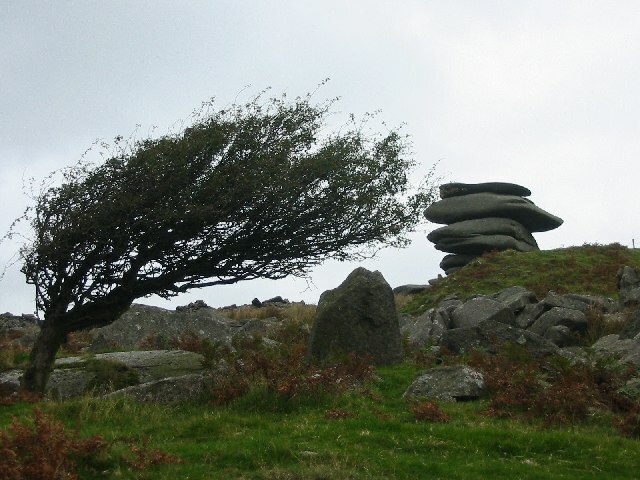 The book starts on this very personal level but the message is a universal one: how mankind deals with the mystery of his existence and tries to resolve his longing to belong on this earth – in the case of Cornwall, it is more often than not by piling massive stones one upon the other in the shadow of mountains and moors whose ‘spirit of place’ unforgivingly works its magic on your soul. We are taken around Bodmin Moor, Tintagel and Land’s End, usually in the company of a local scholars, past and present: the engaging and clearly very persistent John Leland, Henry VIII’s antiquary who was spellbound by Glastonbury and undertook an exhaustive, and probably exhausting, audit of the antiquities of the British Isles; the historian and national mythmaker Geoffrey of Monmouth; the local poet Jack Clemo, who struggled with blindness and gave short shrift to feeble-minded Romantics and various friends who he meets up with on the way. We see Cornwall’s mythological landscapes as having something inherently spiritual embedded in them or harbouring ancestral spirits that speak of something authentic and primeval. As the author makes clear, this is not a phenomenon unique to Cornwall, despite its fame, but a inherently human quest to be found the world over – from Ancient Romans with their garbled communication with the heavens in grottoes and beneath oak trees, to modern day spiritual healers – who have set up shop throughout Cornwall. Philip Marsden offers no hard line spiritual interpretation for the existence of the ritual landscapes he visits, insisting that there are as many explanations as there are visitors. He limits himself to delighting in them as works of art and revelling in the endless interpretative possibilities, while the sense of awe he genuinely feels remains undiminished. Cornwall is not just a collection of delightful locus amoenus, or gardens of earthly delight that trigger associations with the Garden of Eden or warbling nightingales. They can be ominous and terrifying too, judging by some of the reactions to the magnetic pull westwards felt by many visiting Land’s End. Glastonbury is no garden of ease – we discover it is the mythic heart of England, where Christianity arrived and King Arthur was buried – a place endowed by God with “sacred gifts”. Reading a Philip Marsden book is always a pleasure: the author speaks to the reader confidentially, as if to a friend or a fellow member of a curious tribe made up of disinterested scholars, distracted naturalists, and rugged geologists with classical educations that have gone pleasantly, but productively, awry. “Rising Ground” is an excellent book by a gifted writer – part travelogue, part history and part natural history. The book will appeal to those who love and know Cornwall and to those who are approaching it for the first time. 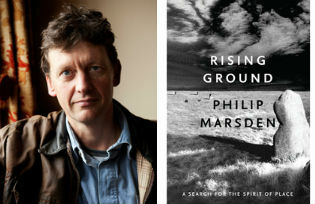 PHILIP MARSDEN is the award-winning author of a number of works of travel, fiction and non-fiction, including The Bronski House, The Spirit-Wrestlers, and The Levelling Sea. He is a Fellow of the Royal Society of Literature and his work has been translated into fifteen languages. He lives in Cornwall.